We have some amazing reviews on Trip Advisor from guests who visited us in the recent past. 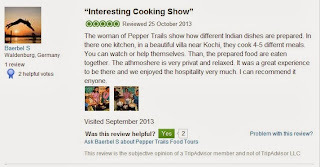 We are happy to see those smiling faces, this further demands our focused attention to strive towards providing an ‘experience to carry home’ for our dear guests. Thank you all who visited us and spared their time to put down their appreciation in writing. The roots of all goodness lie in the soil of appreciation for goodness! !